Moscow and Washington have agreed to facilitate a possible solution to the Syrian crisis by setting up an international conference by the end of May. They will try to organise a meeting between representatives of the Syrian government and the opposition. The conference that aims at working out a political solution to the crisis, will serve as a follow-up to the Geneva communique. 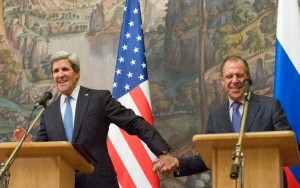 “Russia and the US will encourage both, the Syrian government and the opposition groups to find a political solution. We have agreed upon the need to convene an international conference, arranged as a continuation of last June’s Geneva meeting, as soon as possible, probably at the end of this month,” Sergei Lavrov, Russia’s foreign minister, said at the press conference following a meeting with the US secretary of state John Kerry. He also stressed that Russia and the US will respect Syria’s sovereignty and its territorial integrity. Lavrov highlighted the significance of the Geneva communiqué. “We believe that the Geneva Communique is really an important way to put an end to the bloodshed in Syria. This should not be a piece of paper, or empty diplomacy, but it should pave the way for a new Syria, where there are no longer massacres,” he said. Implementation of the Geneva communique requires mutual consent of both sides, Lavrov added. Both Kerry and Lavrov stressed their support for the Geneva roadmap and see political dialogue as the only solution for Syria. The alternative is increasing violence, a humanitarian crisis and the country’s disintegration, Kerry said. Russia and the US vowed to work in partnership to bring the sides to the negotiation table, involving other states that should express their commitment to help Syrians find a political solution to the crisis. After the Geneva communique was approved last year the Syrian government said it was ready to work on this basis. Russia and the US have previously expressed completely different positions on the Syrian crisis, with the US placing the blame on Assad’s government and supporting the opposition. Meanwhile Russia and China have repeatedly blocked different UN Security Council resolutions on Syria, saying they were biased in favour of the opposition.